This work brings together writings on television published in Quarterly Review of Film and Video, from essays by Nick Browne and Beverle Houston to the latest historical and critical research. It considers television's economics, technologies, forms and audiences from a cultural perspective that links history, theory and criticism. 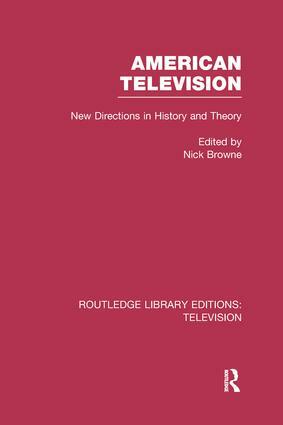 The authors address several key issues: the formative period in American television history; the relation between television's political economy and its cultural forms; gender and melodrama; and new technologies such as video games and camcorders. Originally published in 1993.